How To Validate An eSign? Home / eSign / How To Validate An eSign? After getting your eSign on a document, it is important that you validate your eSign as the validation adds to the rightfulness of your eSign. But before knowing the procedure to validate eSign, let’s understand how an Aadhaar-based eSign works. If you want to understand the procedure to eSign then you may read our article on how to eSign a document. An Aadhaar-holder is authorised to electronically sign a document online using eSign service. The eSign service is facilitated by Application Service Providers like us (eSigDesk.com), duly registered with CDAC (ESP) and in collaboration with the Unique Identification Authority of India (UIDAI). The Aadhaar-holder can affix his/her eSign on any electronic content by authenticating himself/herself through OTP received on their mobile number registered with Aadhaar. At the backend, the key pair is generated and a Digital Signature Certificate (DSC) is issued by the Certifying Authority (CA). Following this, the eSign is affixed to the document and returned back to the signer. 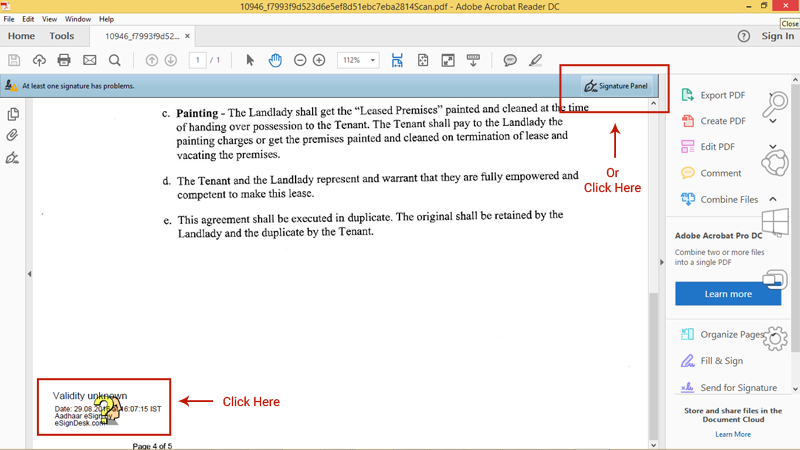 Open the eSigned document with Adobe Reader. 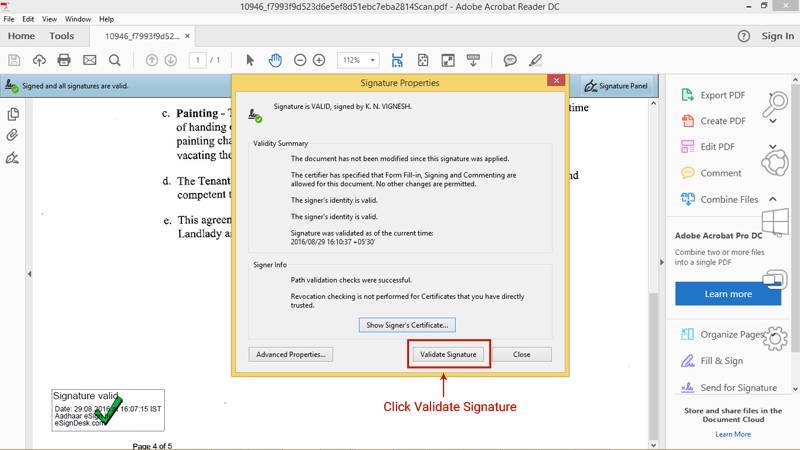 Click the Signature Panel or eSign appearance on the document. In the ‘Signature Validation Status’ window that opens, click ‘Signature Properties’. 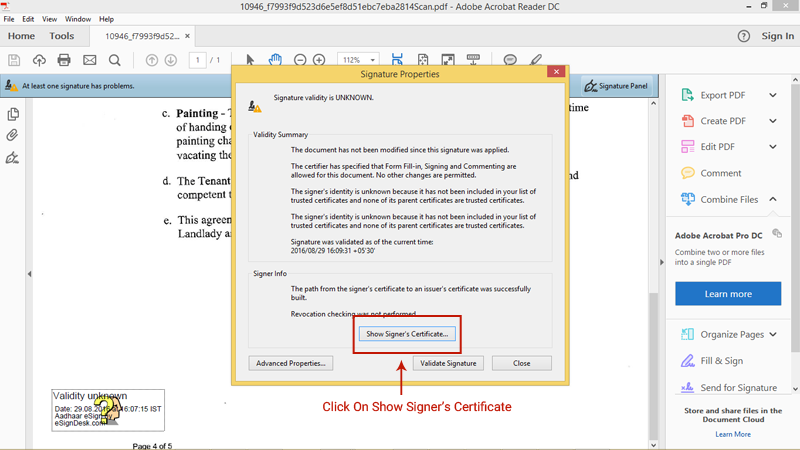 In ‘Signature Properties’ window, click ‘Show Signer’s Certificate’. You will be redirected to ‘Certificate Viewer’ window. Click the tab named ‘Trust’. Click ‘Add to Trusted Certificates’. Click ‘OK’ in the pop-up that follows. You will be redirected to ‘Import Contact Settings’ window. Check (Tick) the boxes provided before Certified documents and the three other options that follow. Then click ‘OK’ to continue. You will be redirected to ‘Certificate Viewer’ window, click OK at the bottom. 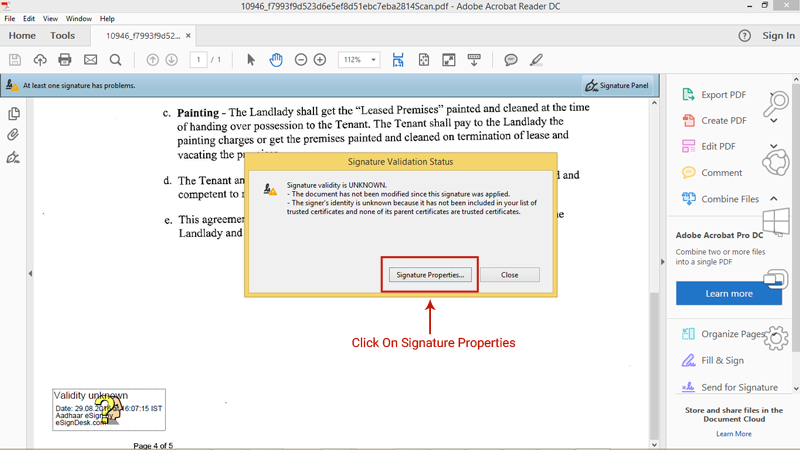 Click ‘Validate Signature’ in Signature Properties window. And then click ‘Close’. Now your eSign is complete. Your eSign will have a green colored ‘Tick mark’ which means it is validated. How To Verify An eSign? If you want to see signer’s details just to make sure that it is a valid eSign, you can verify it by following these steps. 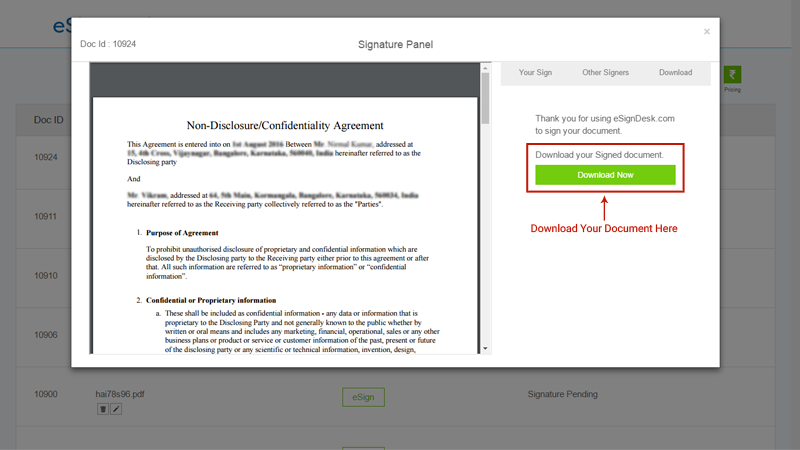 Once the document is opened, go to Signature Panel and right click on Signature. In show signature properties, click on Show Signer’s Certificate. In the signer’s certificate, you will see the details of the eSign and the hierarchy: CCA India – C-DAC CA – Signer’s Name, which is a proof of its legitimacy. 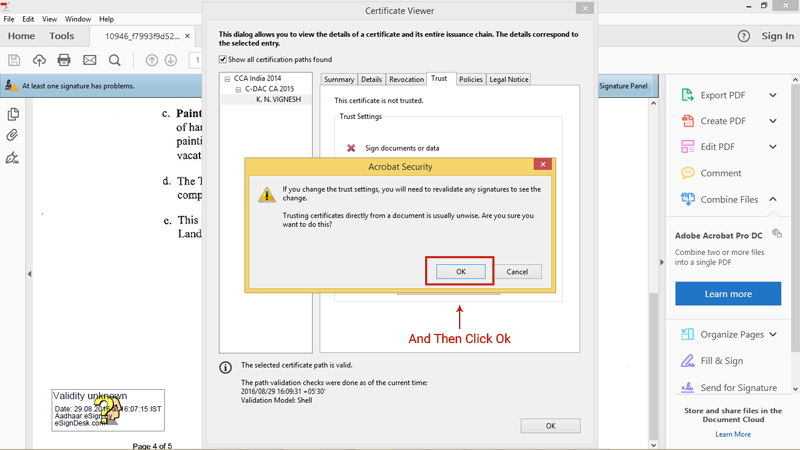 If an eSigned document has been tampered with after signing, then the certificate associated with that eSign becomes invalid. When you click on Signature in the Signature Panel, you will see this message – ‘Document has been modified since the signature was applied’. How Will Your eSign Look Before And After Validation? An eSign will have the signer’s name, date and time of signing. 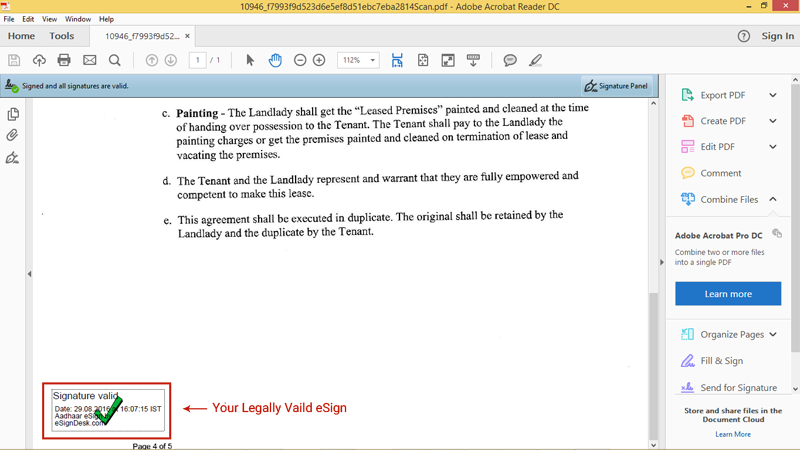 Here’s an image of how an eSign would look on a document before validating it. 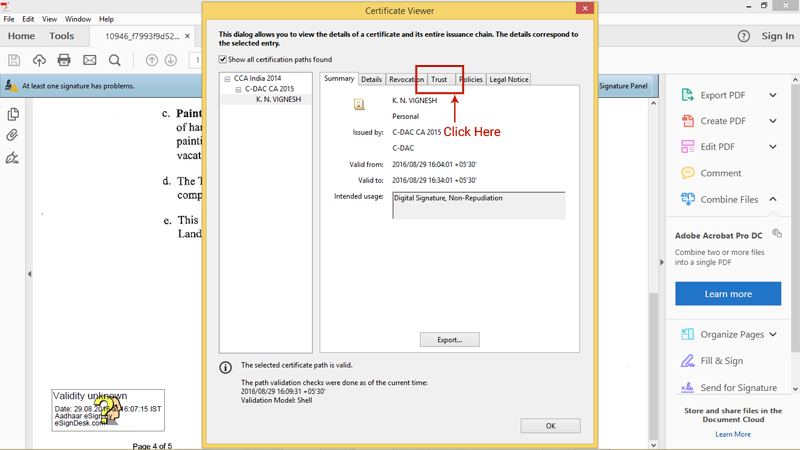 How Long Is The eSign Valid? Though the DSC associated with your eSign is valid for 30 min only, it doesn’t mean that your eSign’s validity will also come to an end. Only the private key associated with the eSign is destroyed in 30 min in order to prevent any misuse, thus making it more secure. However, the eSign is valid forever. The contract on which you have eSigned will only end after the completion of the term or as mentioned in the contract. So you need not worry about the validity of your eSign. If you still have any questions about eSign, visit our eSign FAQs page where you will find the most common questions asked about eSign answered. 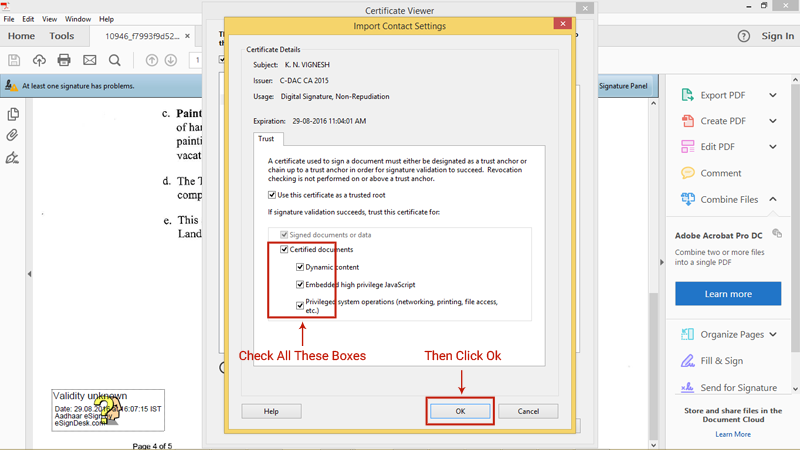 Check out below for step by step procedure to validate an eSign. 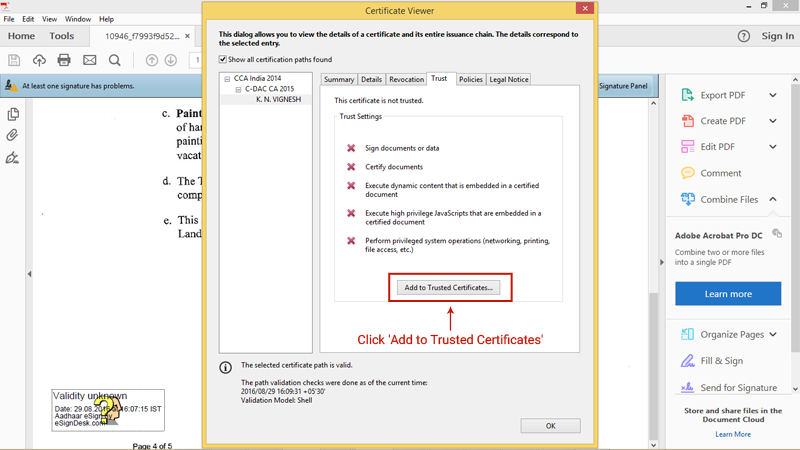 In the ‘Certificate Viewer’ window, click the tab named ‘Trust’. Now, we believe that you have understood the procedure to eSign a document and also to validate it. So why wait? Get ready to sign your documents online using our eSign service.